Welcome Home to this Beautiful 3bed/3bath LAKEFRONT home located in the heart of Belle Isle on The Lake of Conway Chain of Lakes. 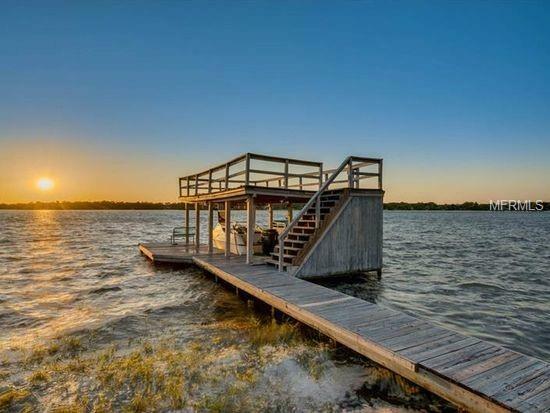 This home has Direct Lake Frontage with a BOAT HOUSE and DOCK, offering some of the most breathtaking Nightly Sunsets. From the moment you enter the front door you will be in love with its breathtaking west views, homes charm and character. This home was custom built in 2002 and features A-frame windows to provide unobstructed water views. Large Chef Kitchen with custom maple wood cabinetry, granite counter tops, stainless steel appliances including a hood and gas range. Maple hardwood floors throughout most of downstairs. Relax by the fireplace and admire the antique copper design. This homes floor plan was well thought out with an open Great Room with 22 ft+ cathedral ceilings, 4 access doors to lake and access to a Florida dinning room with plenty of windows to get natural light in. In addition, 3 en suite bedrooms. Master suite down stairs has a charming imported stained glass window, barn style door and dual French doors with access to in-ground hot tub. Upstairs suites offer plenty of privacy, large bedroom, closets and lake views. Embrace the Florida Lifestyle and BBQ on your large screened patio, lush landscaped yard, and park you boat in your 23+ foot 2 story boat house and dock with lights and lift. Just minutes from Downtown ORLANDO, Airport, major hospitals, quick drive to Attractions. NO HOA and well maintained with lots of pride. Must seeâ¦ It wonât last long.